Drive is the grindhouse film of this generation (I haven’t yet boiled it down to exact mathematics, but it seems film generations are akin to turtle years). It’s a Man With No Name story directed by Danish filmmaker Nicolas Winding Refn, and it’s something of a surprise. Unless you’ve been under the celluloid rock, you’re no doubt aware of the up-and-coming Ryan Gosling, who has starred in multiple films this year and will star in the sure-to-receive-several-Oscar-nominations The Ides of March, alongside George Clooney, which opens next month. Gosling plays the protagonist of Drive, a literal Man With No Name credited only as “The Driver,” and Refn goes to painstaking lengths to avoid having other characters speak his name. In proper MWNN fashion, the Driver apparently appeared out of nowhere one day, asking for a job at a garage owned by Shannon (Bryan Cranston), a grizzled mechanic with a bad leg. Seeing the Driver’s talents, Shannon gave him a job on the spot. The film’s narrative begins while the Driver is wearing three separate hats in his life: he does stunt driving for movies, works at the garage, and moonlights as a getaway driver for criminals. He barely speaks and has no visible ties to anyone, except maybe Shannon, who treats him as a sort of adopted son. After a wonderful, non-animated car chase that has been compared to the likes of Bullitt (a prerequisite to watching this film), we find the Driver bumping into his neighbor, Irene (Carey Mulligan). She looks after her young son while her husband is away at prison, and for an undisclosed reason, the Driver decides to help her out. During these scenes, we bear witness to beautiful pieces of cinematography. 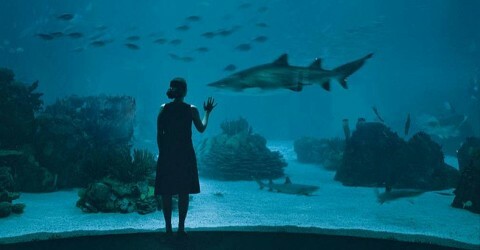 Several scenes are acted out in one flowing shot. Others make brilliant use of mirrors, such that the facial expressions of three characters, all facing different directions, are visible at one time. The Driver and Irene become familiar with one another, but they don’t sleep together; she clearly loves her family and just needs a friend. Eventually, her husband, Standard (Oscar Isaac), comes home, and we immediately see why he landed in prison. He’s genuinely devoted to his family, but try as he might, he keeps getting involved with the wrong kinds of people, and already finds himself owing protection money to a few bad folks. Instead of telling the Driver, who has taken a clear interest in his wife, to leave the family alone, Standard sees him as an opportunity to settle his debt. In a gorgeous scene featuring the best use of an “Exit” sign I’ve ever seen in a film, Standard hires the Driver to help him with a simple heist. The Driver agrees, only because the completion of the heist will get the bad people away from Irene and her son for good. The heist ends up being the biggest disaster since the heist from Reservoir Dogs, and the film jumps from PG-13 to R in one second flat when a character’s head is blasted with a shotgun in slow motion. We are introduced to the other major players, Bernie Rose (Albert Brooks), a movie producer who wants to hire the Driver; and Nino (Ron Perlman), a Jewish gangster who owns a pizzeria and who is also responsible for Shannon’s bad leg. In the action that follows, the Driver hunts down the offenders one by one in order to secure Irene’s safety. 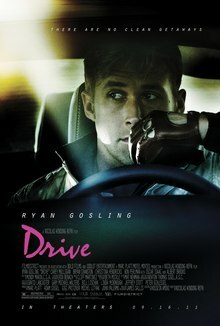 Drive is a film most easily swallowed if taken at face value. The problem with a MWNN story is that if you’re too good of a screenwriter, you run the risk of making the character too interesting. If a character is interesting, the audience wants to know more about him, and the MWNN mustn’t reveal anything about himself. Why is the Driver so silent and distant, yet immediately obsessed with the safety of Irene and her son? How is he so adept at taking down trained mobsters, and why is he so stoic about cold-blooded murder? Some of his behavior may hint at Asperger’s Syndrome, but none of this is ever explored, and we’re politely asked to ignore it once the violent parts begin. Still, the film remains more about characters than anything else. Carey Mulligan, always a magician on the screen, is given very little to do other than sit around and mope, but she owns the scenes in which she appears. Oscar Isaac, whose character comes and goes within fifteen minutes, gives the most sympathetic performance, where the character could easily have been the cliche’d Bad Dad who doesn’t care about his family. Standard, however, truly wants what’s best for Irene and the kid. Bryan Cranston is a good fit for the classic ill-fated mentor, and the casting of Brooks as a villain is inspired, if odd to see (imagine Jeff Bridges stabbing crippled people in the throat, and you’ll have a good idea of what this looks like). Ron Perlman gives a full-caliber performance as the sparsely-seen Nino, and is quoted as saying (when asked by Refn why he would want to play this character after appearing in so many great films), “I always wanted to play a Jewish man who wants to be an Italian gangster…because that’s what I am…” Drive also features a brief appearance by the multi-talented Christina Hendricks, who plays the underused (and perhaps unnecessary) character of Blanche. The film’s weaknesses include the abrupt jump to gory violence, which dilutes the film’s great mood. In addition, the music is a bit invasive. The lyrics tend to narrate how we’re supposed to read the film’s events, almost like a first-person narrator shelling out all-too-revealing thematic passages (though the use of the song “A Real Hero” imbues the film with a fairtytale-like quality). Despite these issues, Drive deserves attention. The performances are solid and impassioned across the board, and the film achieves a level of true grindhouse cinema, mainly because it’s not self-conscious and has a small budget. This is a piece of art that demands polarized opinions. I think more art should be that way. Do you even remember the last thing you felt “neutral” about? I certainly don’t. Drive (2011); written by Hosseini Amini (based on a book by James Sallis); directed by Nicolas Winding Refn; starring Ryan Gosling, Carey Mulligan, Albert Brooks and Bryan Cranston.